Preheat oven to 450 degrees, with baking stone inside, on the lower rack. Cut the chicken into 1/2" chunks. Heat olive oil in a skillet over medium-heat. Saute chicken in a skillet, tossing ocassionaly, for 10 minutes, being extra careful not to overcook it. Transfer chicken chunks to a bowl and set aside to cool. When cooled, toss with about 1/4 cup of the bbq sauce. Roll out pizza dough to a 10-12" diameter on your pizza paddle and place onto pizza stone and bake for 1-2 minutes to slightly bake crust. Remove from oven. Brush on a thin layer of the bbq sauce onto the dough. Sprinkle on a layer of mozarella. 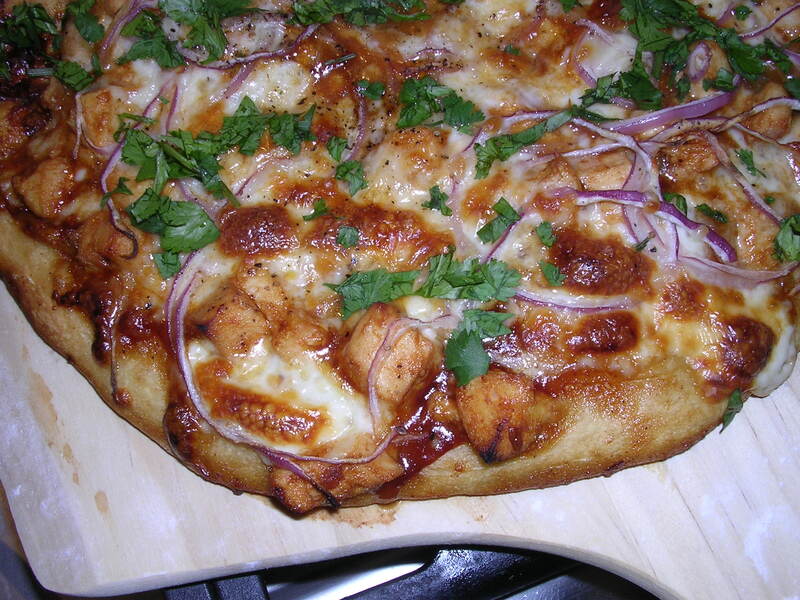 Layer with chicken chunks, then spread red onion slices evenly on top. Transfer the pizza from the paddle by tipping it gently to the heated baking stone. Bake for 7-10 minutes or until crisp on the bottom and golden on the top. Remove from oven and let cool for 3-5 minutes. Sprinkle generously with the chopped cilantro. Cut using a pizza cutter or sharp knife. Serve. I made this last night with Pillsbury Thin Crust Pizza Crust (since I don't have a baking stone) and it was a huge hit! Thanks for posting this recipe!